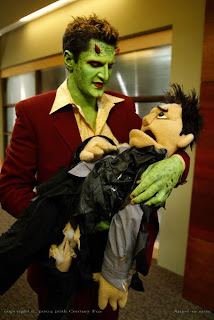 Last month, the wonderfully talented Andy Hallett died of congestive heart disease at the age of 34. Andy was best known for playing the singing host-with-the-most, Krevlornswath ("Lorne"), on Joss Whedon's sci-fi drama Angel for four seasons. Lorne is a green-skinned demon from the music-less dimension of Pylea. After he is sucked through a portal to Los Angeles, Lorne establishes Caritas, a demon-friendly karaoke bar where humans and demonic beings alike are encouraged to bare their souls through song. To the crew of Angel Investigations, Lorne is a mentor, a confidant, and a trust-worthy friend whose gentle nature is the yin to their yang. After Andy passed away, a friend and I selected some of our favorite Lorne clips from his 76 episodes on Angel and pieced them together in a 7 minute farewell tribute in memory of the actor and the character he embodied on one of our favorite series. We tried to post the tribute on Youtube but were blocked because of copyright infringement as the video "may have content that is owned or licensed by FOX". The heated debate over copyright on the web is one that I won't get into now, though it can be argued that fan-made video tributes do far more to attract new audiences to genre television than to harm corporate revenue streams. Ahm, Fox. To keep our tribute and Andy Hallett's memory alive, I have instead embedded our video here in Quicktime format. Andy, you are missed! Here are another ten cliff-hangers being consumed this month by literary enthusiasts on the F train during the commute between Manhattan and Brooklyn. Enjoy the sneak peek!